Le transfert de l'or physique de l'ouest vers l'est, s'accélére, entrainant avec lui d'importantes mutations, pour les cours de l'or. Ci joint une étude synthétique de Ross Norman avec de nombreux graphs, sur la demande d'or chinoise et indienne. et gros potentiel pour l'or d'investissement...physique ! est à présent président d'un fond de pension chinois, The National Council For Social Security Fund. le tout en forte augmentation par rapport à l'année précédente. JPM roule pour la Chine ? les chiffres ne correspondent pas, et il y aurait bien plus d'entrées d'or COMEX -jpm ce mois de décembre, que de livraisons effectuées à son profit ! La Chine serait'elle en train de préparer un hold up sur le Comex? Just for fun, let's explore one other option....and this is pure speculation and conjecture. What if the twenty metric tonnes of gold deposited into JPM's eligible vault over the past two months really is 20,000 Kilobars, of the 999 fineness variety? Why would JPM be holding, at a minimum, 20 metric tonnes of Asian Kilobars in their NY vault? Could these have been acquired for a big Asian client (China)? If so, does this give credence to the idea that JPM's client is China and, by extension, China is the big NET LONG on the Comex, converted from NET SHORT after successfully driving price down by over 30% in the past year? Lots of folks think this is possible and why not? Our buddy Koos Jansen pegs Chinese imports this year alone at 2,500 metric tonnes. (http://www.ingoldwetrust.ch/shanghai-gold-exchange-physical-delivery-equals-chinese-demand-part2) If you were buying that much gold and had easy access to smash the price first, wouldn't you do it that way? I've often stated that JPM's verifiable NET LONG Comex gold futures position is a market corner and it gives them the ability to break and take control of The Comex at a time of their choosing. If this position is actually China's...well, that certainly changes the dynamic a bit, doesn't it? And now JPM (China) is stashing away 2 metric tonnes per day of Asian-standard Kilobars? And One Chase Manhattan Plaza is the building which has, at it's sub-9 grade level, the largest precious metals vault in the world (http://www.zerohedge.com/news/2013-03-02/why-jpmorgans-gold-vault-largest-world-located-next-new-york-fed), directly across the street from the NY Fed vault? So the question (thought experiment) becomes...Is China planning a takeover/buyout of The Comex? 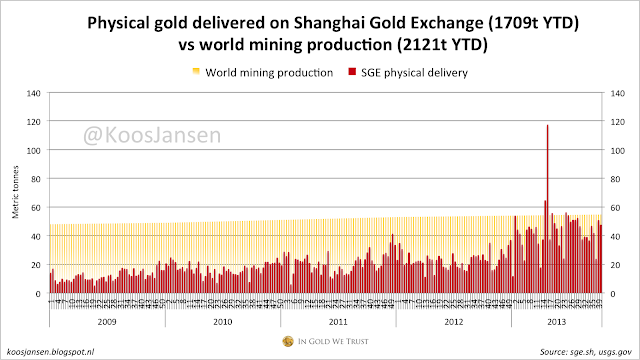 It would seem that The Chinese are readying themselves to dominate metals trading in the 21st Century...They own the LME already and Shanghai is supplanting London as the world's largest volume precious metal delivery hub. Why not take global control of precious metal futures, too? IF that were to happen, what would this mean for price? With "control" of precious metals futures pricing and trading, would The Chinese perpetuate the manipulation or would they eliminate it? If The Chinese are moving toward the eventual backing of the yuan/renminbi with gold and/or silver, would it benefit them to have higher prices or lower, once they have physically taken control of the majority of the world's gold? Je souhaite à tous nos lecteurs de passer un très bon réveillon, ainsi que d'excellentes fêtes de fin d'année . la bonne nouvelle, c'est que Koos Jansen, va désormais suivre les primes sur les livraisons d'argent sur le Shangai exchange ! il doit avoir les oreilles qui trainent ! Nan, je plaisante... évidemment ! quand on voit ce qui est arrivé sur le cours du cuivre, précédemment utilisé comme garantie, l'explication vaut la peine de s'y intéresser. soit environ 2 000 tonnes sur une base annuelle, représentant la quasi totalité de la production mondiale d'or. "La demande d'or chinoise reste robuste», écrit Jansen. Il ajoute que le marché de l'argent chinois est en déport grave ( backwardation ), indiquant une pénurie de métal. une fois de plus, le world gold council pris en flagrant délit de tromperie. Koos Jansen décortique leur dernier rapport sur la demande d'or chinoise et nous montre pourquoi le chiffre de 1066 tonnes, avancé par le WGC est erroné.